Swizec Teller published on September 20, 2016 in Front End, Technical. It’s happening! We’re moving Yup to React! ?? We’ve had a bug for the past 4 or 5 months that everyone on the team and every user has seen. We’ve even got in-the-wild video recordings of it, but nobody has been able to reproduce it reliably enough to even begin debugging it, let alone fix it. After many months of poking and prodding and cajoling and covertly moving our codebase from ES5 to ES6, I got the green light to embark on an epic re-architecture refactor adventure. The refactor to end all refactors. The update to take us to infinity and beyond. Of course, this refactoring can’t endanger the product roadmap, slow down the team, or cause any sort of inconvenience for the business. That’s right. For the foreseeable future (possibly forever? ), the React and Backbone parts of the code have to live together in harmony. To get things started, we’re going to limit this Epic Refactor™ to a small, 7,100-line part of the codebase. That’s not terrifying at all! I mean, what could possibly go wrong™? Today, I built a quick proof-of-concept for how we can put large swaths of existing code into an otherwise React application. React is going to become the main part. Less React than Backbone at first, but React will be taking over the orchestrating of what renders when and how and where. This is a typical Backbone pattern. You have a model that holds some state, a Handlebars template that puts variable values into HTML, an events hash, and a change listener. The user clicks a button and triggers a jQuery event, which calls the buttonClick callback. buttonClick updates the model, which triggers a change event. This triggers a component re-render, which inserts updated HTML into the page. It’s reactive and almost functional. Pure beauty. Not so great in practice… it’s kind of a mess. Don’t believe me? 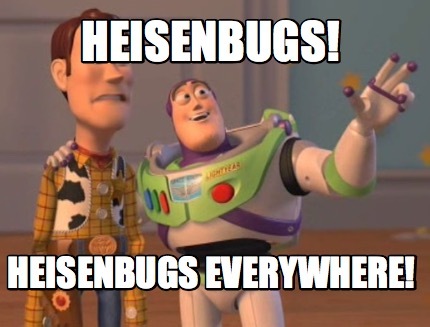 Re-read the 2nd paragraph about Heisenbugs. Our React component that doesn’t do much: it renders a <div> element and uses Backbone’s setElement function to tell a Backbone view that this is where it should live. That was easy. I did it all before my 3rd cup of tea! ? Now I’m stuck trying to make the data architecture inter-op. How do I build an overall unidirectional data flow architecture that works with these independent Backbone+Model views? … but #mobx smells a lot like Backbone-style state management and that’s the whole reason we need a refactor. P.S.– I could seriously use some help with this refactor thing. If you’re looking to get hired, shoot me an email.